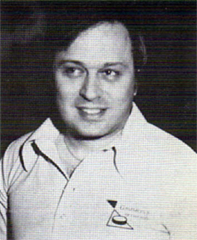 Howard Markowitz Howard Markowitz is the director of Gammon's of Chicago. After playing backgammon on the organized club level in 1976, and amassing the largest lifetime master point total in the Chicago area by playing four to five times a week at different hotels and restaurants, he opened — along with his partner Ida Weil, with great help from former National Backgammon League head Bill Davis — in December of 1979. At this "permanent home" of Chicago Backgammon, he has tried to combine all facets of the game, including: regular small tournaments four times weekly, major annual tournaments, casual play twenty-four hours a day, and a program designed to develop new players. He feels the recent success of Chicago players at regional and national tournaments is at least partially due to the competitive exposure they get at Gammon's. He hopes that anyone coming to Chicago will spend at least part of their time at Gammon's. Howard will make sure they get all the friendly action they want.